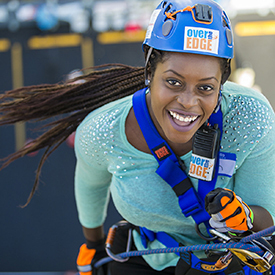 Help us raise organ, eye and tissue donation awareness to the sky … and then take it Over The Edge with it’s newest fundraising event this spring. 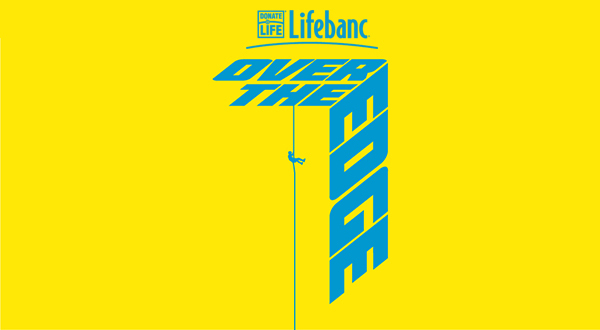 Lifebanc Over The Edge is a heart-pounding, adrenaline-fueled fundraising opportunity where participants rappel down the side of the 23-story Oswald Centre in downtown Cleveland to raise money and awareness for Lifebanc and organ, eye and tissue donation. The event will take over the corner of East 12th and Walnut on May 30-31, 2019. Waiting for a life-saving organ transplant is scary. Right now, 1,623 people in Northeast Ohio are waiting for a life-saving organ donation. Thousands more will need the healing power of tissue donations in the coming year. Over The Edge allow people to conquer their own fears and help eliminate the fear of those waiting for the Gift of Life! Individuals or organizations who reserve their space and commit to the fundraising minimums will be able to take part in this once-in-a-lifetime experience, rappelling down the side of one of Cleveland’s tallest buildings. More importantly, they will help to raise funds for Lifebanc, Northeast Ohio’s organ procurement organization. Lifebanc saves and heals lives by facilitating organ, eye and tissue donations and providing community education on the incredible impact of organ, eye and tissue donors. This unique event is limited to the first 60 registrants who commit to a minimum fundraising total of $2,000 or $5,000. 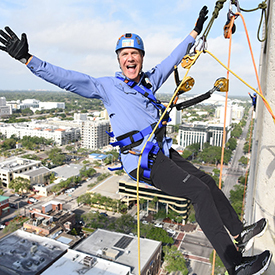 Lifebanc Over The Edge will raise important funds that help Lifebanc bring the life-saving power of organ, eye and tissue donation to more donor families and recipients. Specifically, the event will help Lifebanc provide more community education and continue to care for donor families from their first point of need. In 2018, Lifebanc facilitated the donations of 162 organ donors, saving the lives of 434 organ recipients, and 841 tissue donors, each with the potential to save and heal more than 50 people. Thanks in large part to the financial and general support of the Lifebanc community, the number of people saved yearly by organ donors from Northeast Ohio has risen 41% in the past five years.